This entry was posted in Comments and tagged Plant tour, Toyota. The City of Monozukuri: The Art of Making Things is a chapter about Nagoya, Japan, in a book by Austrian historian Karl Stocker, entitled The power of design : a journey through the 11 UNESCO cities of design. “With Nagoya at its center, the Chubu region is the world leader in monozukuri. As a result of technological innovation, local industries which traditionally flourished in the region developed into modern ones, eventually becoming today’s most advanced industries. For example, a textile industry began with the production of cotton fabrics, then developed into Japan’s first automatic loom manufacturing industry, and later became a leading automobile industry in the region. The ceramics industry, which thrived thanks to an abundance of high-quality clay, evolved into the fine ceramics of today. And the Japanese clockwork technologies, initially applied to sophisticated mechanical dolls called Karakuri Ningyo, now form the basis of various machine and robot industries. Aichi Prefecture, which includes Nagoya, has led Japan in the shipment of manufactured products since 1977, demonstrating its strong global competitiveness with the world ‘s most advanced technologies. The term monozukuri can be simply translated as “the production of things”, and is derived from the words mono meaning “goods’; and tsukuru meaning “manufacturing”. It is about a process of value-adding activities for the creation, reproduction, distribution and communication of customer’s design requirements. Of importance is the integration of technology in collaboration with development, supply and production. Monozukuri is however also a state of mind regarding the tangible creation and perfecting of things. The primary goal is to strive to “exceed customer expectations” through the manufacturing of a perfect product. In reality the achievements and performances of Japanese companies have inspired Western methods of industrial production from logistics (‘Just in Time’ supply chains), through production (the Kaizen Principle, i.e. the improvement of a product through small steps), to personnel management (working in small groups, and continual feedback from the production level up to management). The score is based on total industrial production, as collected by the Ministry of Trade and Industry, but the site does not explain how it is calculated. This entry was posted in Comments and tagged Monozukuri, Nagoya. The numbers on Manufacturing’s share of the Japanese economy show the sector holding steady at about 19% of GDP, 16.9% of the work force, and a value-added per employee of about $97K/year, placing Japan between the US and Germany on all three metrics, and far from China. The numbers are consistent with Japan’s manufacturing sector paying high wages for high productivity and using advanced technology. On this tour, we will be visiting exceptional Japanese companies, not the average reflected in the sector’s overall performance. The numbers quoted here are still a background against which these outstanding companies operate. We will need to zoom in again further in the next post. 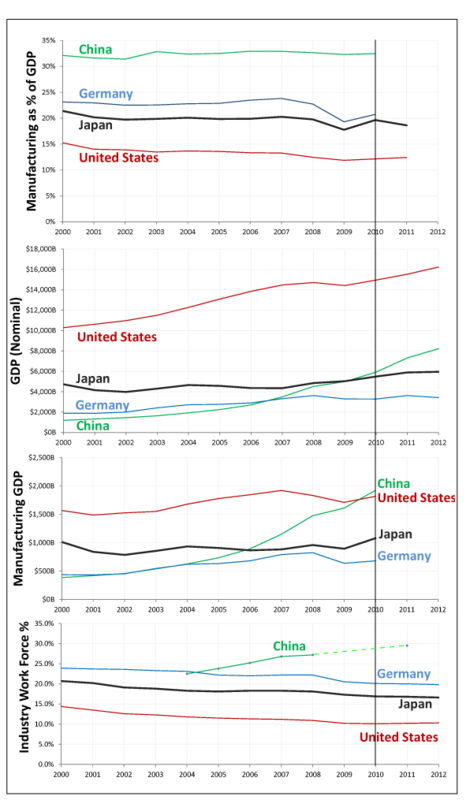 The World Bank provides figures for GDP through 2012 and manufacturing’s share of GDP through 2010 for China and Germany, and through 2011 for Japan and the US. Unlike the CIA World Factbook data that are in Purchasing Power Parity (PPP), the World Bank GDPs are converted into US$ at official exchange rates. The work force data are from the US Bureau of Labor Statistics (BLS). 2010 is the last year for which data is available on all four countries on all metrics. The following charts trace the evolution of the GDP and Manufacturing’s share since 2000. The financial crisis caused a marked dip in Manufacturing’s share in Germany and Japan, a smaller dip in the US, and none in China. The main lesson of this chart for Japan is that its manufacturing sector is holding steady at close to 20% of GDP. The charts below show Manufacturing GDP in absolute terms and the fraction of total employment in Industry, which, besides Manufacturing, also includes Mining, Construction, and Utilities. I would have preferred numbers for Manufacturing, but could not find them. As a share of the work force, manufacturing employment is on a slow decline everywhere except China. We have to be cautious in reading this table. The GDP is far from a perfect gauge, but it has the merit of being available. It is the aggregation of the value added of all businesses in a country, region, or sector of activity of a region.The main we can draw is that the manufacturing sectors of Japan, Germany and the US are similar to one another and all different from China’s. This numbers for Japan, the US, and Germany reflect high wages, high productivity, and advanced technology; China’s numbers, a lingering reliance on low wages, low skills, and manual processes. This entry was posted in Comments and tagged China, GDP, Germany, Japan, Manufacturing, Manufacturing Employment, US. This entry was posted in Announcements and tagged Japan tour, Making things, Monozukuri. In the initial announcement of our tour, I said that Japan is facing the same challenges as other advanced economies, and in particular an aging population receiving high wages. I would like to back up this assertion with the latest available facts about the Japanese economy and the Japanese people, compared, for perspective, with the US, China, and Germany. 1. The agencies collecting data on national economies do not use the same formulas. The figures are quoted from the CIA World Factbook, under the assumption that the analysts who crunch the numbers know how to make them consistent. 2. The currency exchange rates can mislead about the character of the economy. The banks’ rates are adequate for the power to purchase a global industrial product like an iPad. For that purpose, US$1 is worth the same in Shanghai and in San Francisco. But the same haircut may cost US$2.50 in Shanghai versus $100 in San Francisco. In terms of the power to purchase a haircut, US$1 in Shanghai is therefore worth US$40 in San Francisco. If you average this over a basket of goods and services, you get a Purchasing Power Parity (PPP) exchange rate with which you obtain numbers for GDP and Per Capita GDP that represent the way people live in better than bank exchange rates. There are, of course, many ways to do this, and there are goods or services that only exist in one country. In population, Japan is one and a half times Germany, and 40% of the US. Officially, Japan’s unemployment rate is lower than that of the other countries, but the definition of who is employed varies between countries. The Gini index is the most commonly used measure of inequality of income or wealth in a society. The index quoted here is for income. It is 0 if everybody in the country receives the same income; 100 if all of the country’s income is collected by one individual. Worldwide, it ranges from 23 in Sweden to 63 in South Africa. 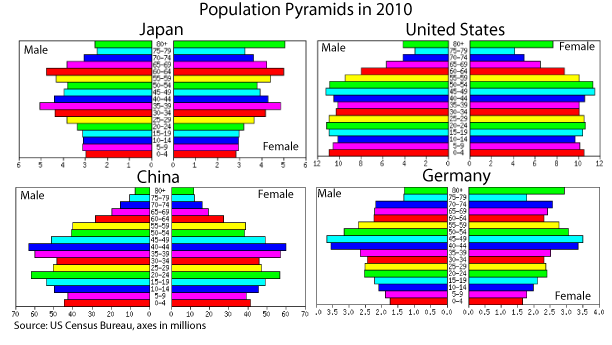 This chart shows Japan as more unequal than Germany, but less than the US and China. This table also shows that one in three Japanese has received higher education, which is almost the same ratio as Americans, and 50% more than Germans. They don’t look like pyramids at all. Japan’s and Germany’s are more like trees, with a young “trunk” and a growing “canopy” of middle-aged and elderly people. China’s base has been narrowed by its one-child policy, but is likely underestimated due to the unregistered second children conceived in violation of this policy. This is the background. Next, we need to take a look at the role of manufacturing in Japan. 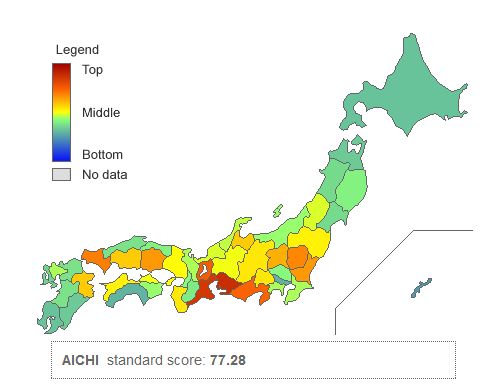 This entry was posted in Comments and tagged economy, Education level, GCP, Gini index, Japan. “My opinion based on living here and dealing with companies here. There is definitely a trend for companies to be moving production from China to Japan but only when the market is Japan. Basically, everything except electricity and labor is actually lower cost in Japan than China so if your product can get over those two humps and your customers are not in China, it makes a lot more sense to do things here. I think the one thing that really attracts me about Japan is that the well-run companies use a very different approach than our MBA style in the West. (The badly ones in Japan use the MBA style – albeit not the way they should) So seeing success achieved in a very different way than we would imagine really forces us to broaden our minds. The amazing thing is this is done with a country like China – 1/10th the labor cost and way less regulations 3 days away by boat! Basically if you have a production site in China, a warehouse in Japan and China your planning would only need to add about 5 working days to the lead-time. Even with this, there is a lot of manufacturing, especially in the mid-sized companies that stays in Japan. Some of the better run companies actually do Kaizen and then challenge their overseas operations to make it better – which they often do! 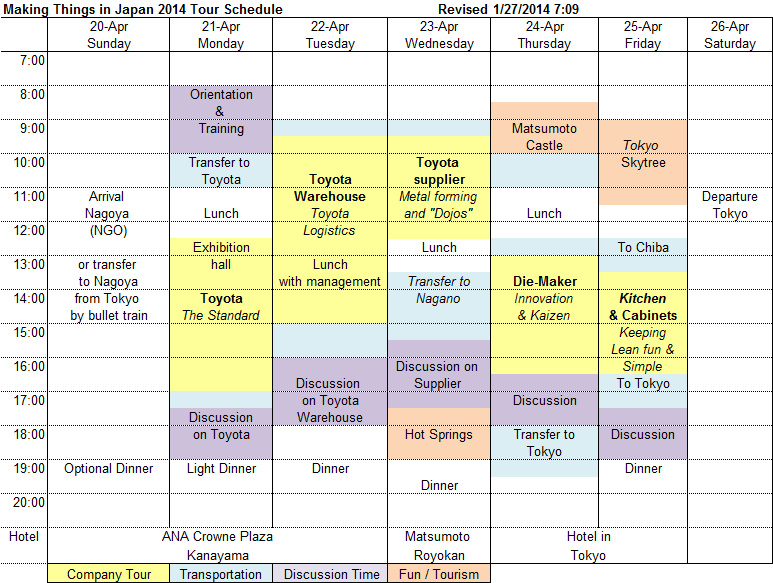 This entry was posted in Comments and tagged China, Japan, Kaizen, Lean, Manufacturing, MBA.